1.Unplug the power to your DSL or Cable modem. 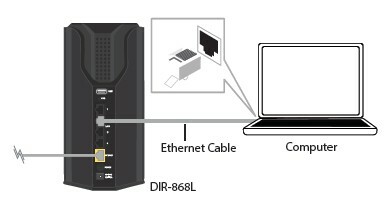 2.Connect an Ethernet cable from the Internet port of the D-Link DIR-868L router to the Ethernet port on your DSL or Cable modem. 3.Connect another Ethernet cable from the Ethernet port on your computer to one of the LAN ports on the router. 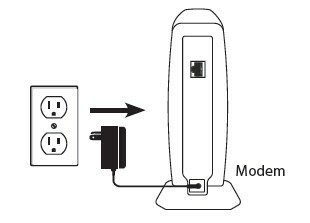 4.Plug the power back into your DSL or cable modem. Please wait about one minute before continuing. 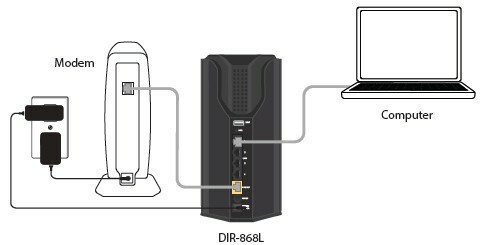 5.Plug the power adapter into your router DIR-868L and connect to an available power outlet or surge protector. If the Power LED does not light up, press the Power button on the back of the router. After the D-Link router has powered up, verify that the Power (green) and Internet (orange or green) LEDs are both lit then continue with the Configuration section on the other side.